Today I also downloaded the trial version of MarsEdit which is another blogging app for the MacBook. I’m writing this post in it. I don’t see a way to add a caption to my image. I also don’t see a way to do a gallery or slideshow. I’m not sure how you embed a YouTube or Vimeo movie. 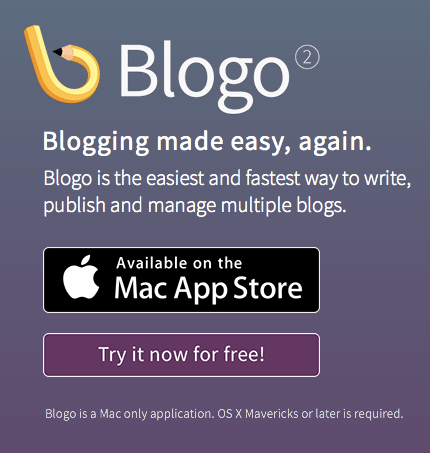 I’m trying out a dedicated Mac app for blogging called “Blogo”. It looks pretty good so far. The only problem I’ve had with it was when I tried to update a post. It made another post instead of updating the existing post. You can also link Blogo to Evernote and write drafts in Evernote and then Publish in Blogo. This is pretty cool because I can write a blog post on my iPad in Evernote and later publish it on my MacBook. This is my new standing work station in the computer room. 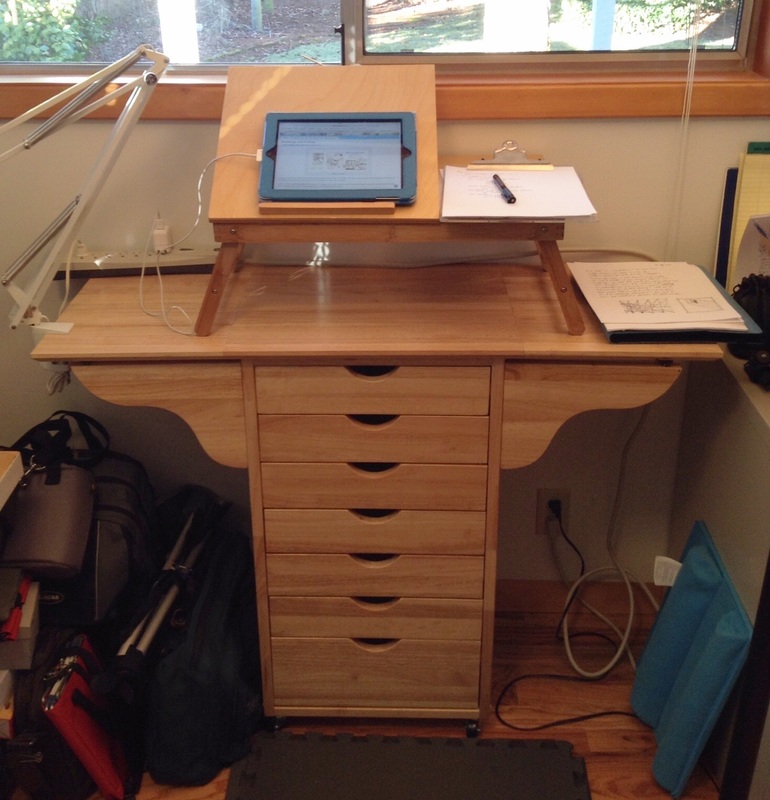 It consists of (from bottom to top) an anti-fatigue foam mat on the floor, a seven drawer craft cart (which is great for storing art materials), and on top is an adjustable tilt-top tray table. I modified the tray table. The top was made from pieced together bamboo and it warped almost immediately. So, I replaced it with 1/2 inch birch plywood. 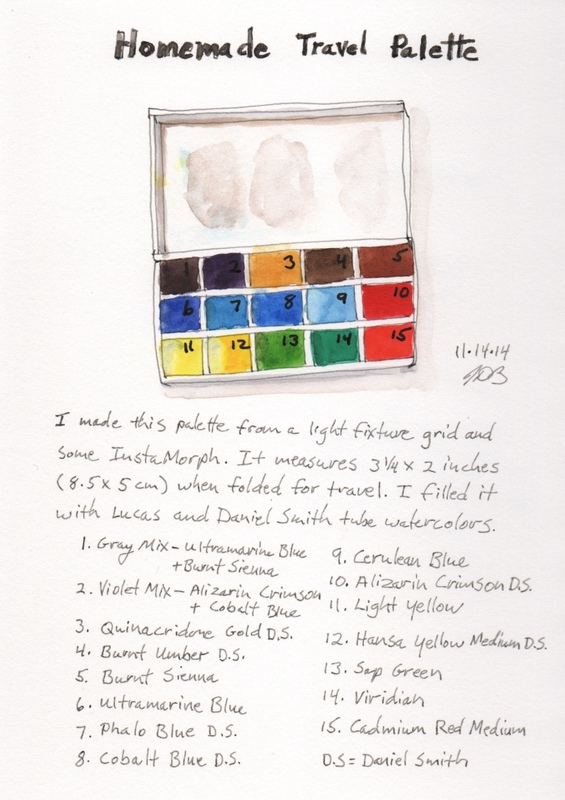 This is my new travel watercolor palette. I made it from a plastic fluorescent light fixture grid panel that’s made up of 1/2 inch (1.5 cm) squares. I cut out a piece of the grid and then molded some InstaMorph plastic to fashion a bottom plate. I made the lid the same way cutting out the grid to leave just a frame. I taped one edge to make a hinge and filled the wells with Lucas and Daniel Smith tube watercolors. When closed the palette measures 3.5 x 2 x 0.75 inches (8.5 x 5 x 1.8 cm) a very convenient size that’s easy to carry in a pocket or bag. I hold it shut with a rubber band. I also attached a magnetic sheet top and bottom to hold it in use on my setup board when painting on location. Stillman &amp; Birn Zeta series 5.5 x 8 inch spiral bound notebook, Mars 500 technical pen with Noodler’s Lexington Gray ink, Lucas and Daniel Smith watercolors. Here’s a photo of the palette open and closed in my hand so you can get an idea of its size. Next I made a chart of all the 50/50 mixes that can be made with these 15 colors. It takes a long time to do these charts, but it is well worth the effort. It’s important to start with clean colors and to keep them clean while you are working. That means cleaning the brush every time you pick up a color to mix it with another color, cleaning the mixing area when it gets full, and changing the cleaning water often. When mixing it works best to mix light colors into darker/stronger colors. Don’t put down wet paint right next to another square with wet paint in it. The two colors will bleed into each other. You can see that on the far left in the third and fourth rows. From then on I worked in a checkerboard pattern, waited until the paints had dried and then filled in the rest of the blank squares in the checkerboard. I like the mixes made with Phalo Blue especially combined with my gray mix to make a nice Payne’s gray, with Viridian to make black, with Alizarin Crimson to make a nice dark brown, and Burnt Sienna to make gray. I also like the mixes with Ceruleum Blue. Mixing it with Viridian makea a lovely turquoise. Mixing it with Burnt Sienna or Burnt Umber creates nice grays. I am not happy with the Lucas Cadmium Red Hue. It does not mix well. I need to find a better warm red. I like the wide variety of greens and earth colors in these mixes. I was surprised by the number of dark value mixes. Here’s a black and white picture of the chart. Notice how many of the colors are darker than mid tone gray. 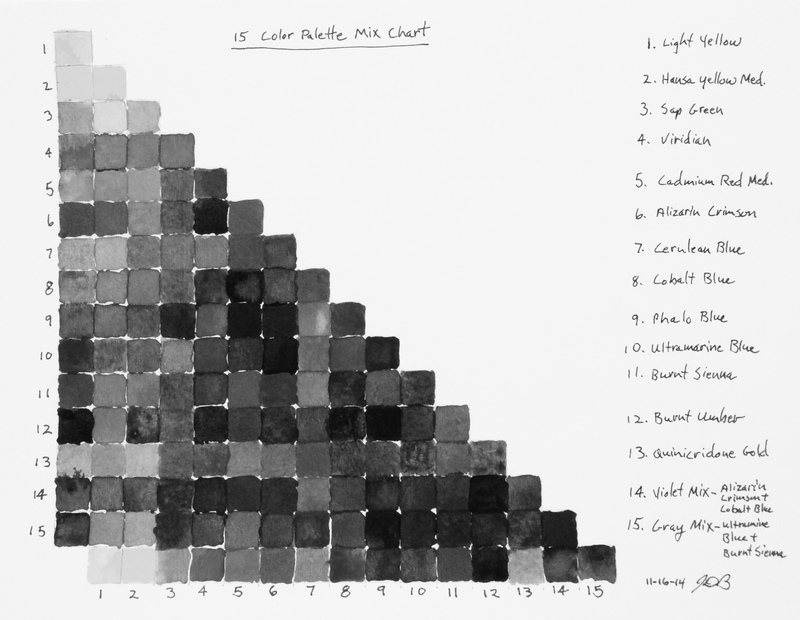 I guess I should have realized how many dark blues and browns I had in my palette, but I didn’t until I saw this chart. I’m pretty happy with my color choices in this palette – particularly here in the Pacific Northwest where we have a lot of greens and browns and our skies show many grays and blues. This week’s Sketchbook Skool Storytelling assignment was to pick or make up a book and illustrate its cover. As a boy I loved reading my father’s books such as Treasure Island, Mysterious Island, and Twenty Thousand Leagues Under the Sea. Some of them were illustrated by the great N.C. Wyeth. For a while I contemplated doing a small oil painting in Wyeth’s style. This seemed a bit ambitious. So I decided to do a watercolor. I thought about it for a couple of days and did these thumbnails and an initial pencil drawing. 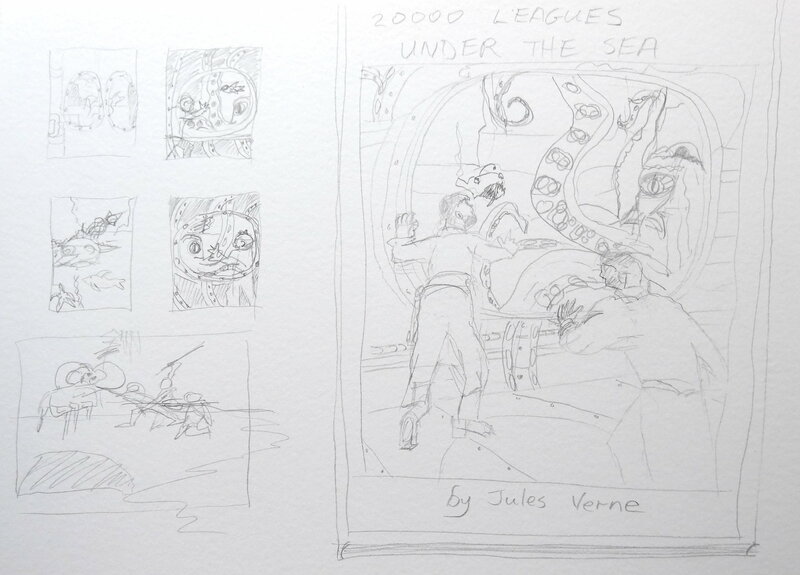 The first four thumbnails were for “Twenty Thousand Leagues Under the Sea” and the last thumbnail was for “The Mysterious Island”. 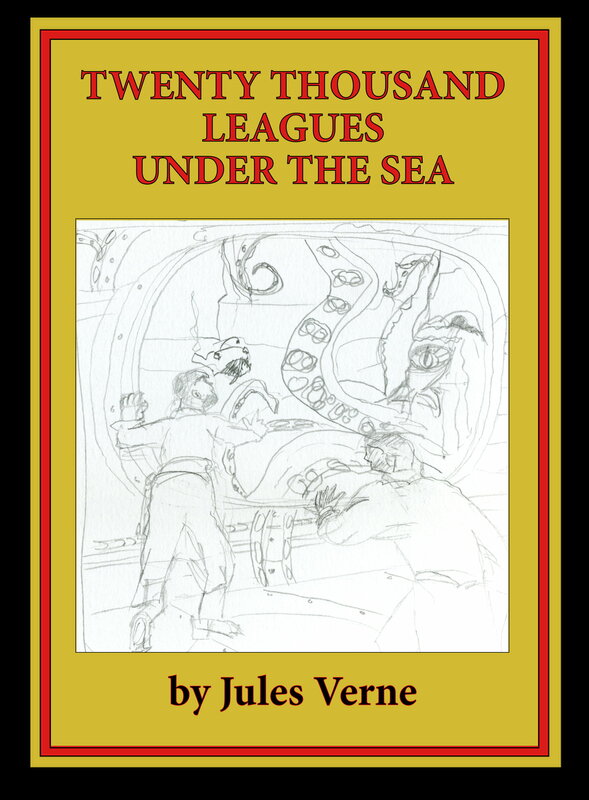 I picked “Twenty Thousand Leagues Under the Sea” and did a larger pencil sketch of the idea. I didn’t want to hand letter the cover because coloring in around letters with watercolor would look messy. I did this mock up in GIMP (the free open source image editing program). As usual it turned out to be more complicated than I anticipated. I wanted the title to be red with a black outline around the letters and the authors name to be black with a red outline around the letters. I tried a number of methods all of which didn’t work. Eventually I figured it out. You have to select the text with the text tool, convert the text to a path, and stroke the path and make sure you select the right foreground color before you do it. LOL. Well I learned something extra in Sketchbook Skool. I liked this idea. However, I thought I’d sleep on it. The assignment called for doing research on the details. 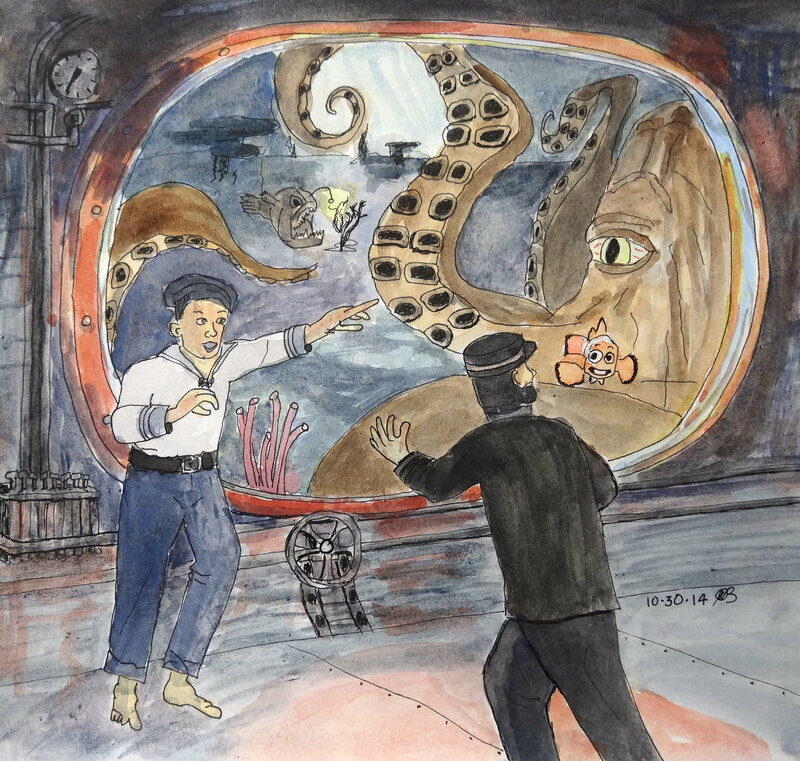 I Googled “weird deep-sea fish” and “giant octopus movies” and “1880 sailor uniforms”. While researching underwater scenes, I looked at Finding Nemo backgrounds (which are beautiful) and got the idea to include Nemo the clownfish in the scene. I then remembered the storyline of Finding Nemo. The movie is really about Nemo’s father, Marlin, as he searches for his son, Nemo. Then I got the idea to have Marlin find the wrong Nemo, Captain Nemo, on the Nautilus. Brilliant! Better ideas really do come with persistence. I drew the illustration again on a larger piece of paper with pencil. I drew and erased at least six versions of Captian Nemo. It didn’t look right. I couldn’t find any reference photos showing him from the back. Finally I had to photograph myself in the right position to draw him as I couldn’t quite get the the head and legs right. I inked the pencil drawing while lounging on the futon with my feet up and a heat pack on my back. I had thrown out my lower back while working in the yard. Sitting at the table bending over a drawing was not a good idea. After dinner I painted the scene with watercolor. Strathmore 300 Bristle vellum paper holds up well to multiple erasures, but it does not handle watercolor well. It buckles and tiny pieces of paper ball up if you scrub it while wet. I photographed the painting and transferred the file to my iMac. 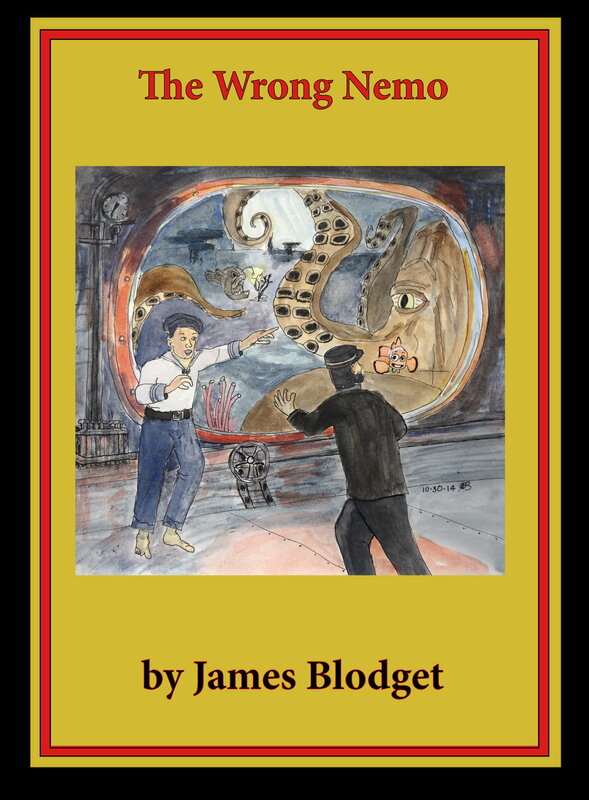 I used GIMP to drop the image into the book cover design and changed the text to read “The Wrong Nemo by James Blodget”. I uploaded the image to SBS at midnight. Done is better than perfect. I learned a lot from this assignment. I really enjoyed doing the research and discovered that it takes more time than doing the finished drawing. I was also reminded how important it is not to settle for your first idea. Allow yourself time and trust that the process will reveal a better idea. Doing an illustration is about creating your own world. You decide what to put in and what to leave out. It’s all in the details. 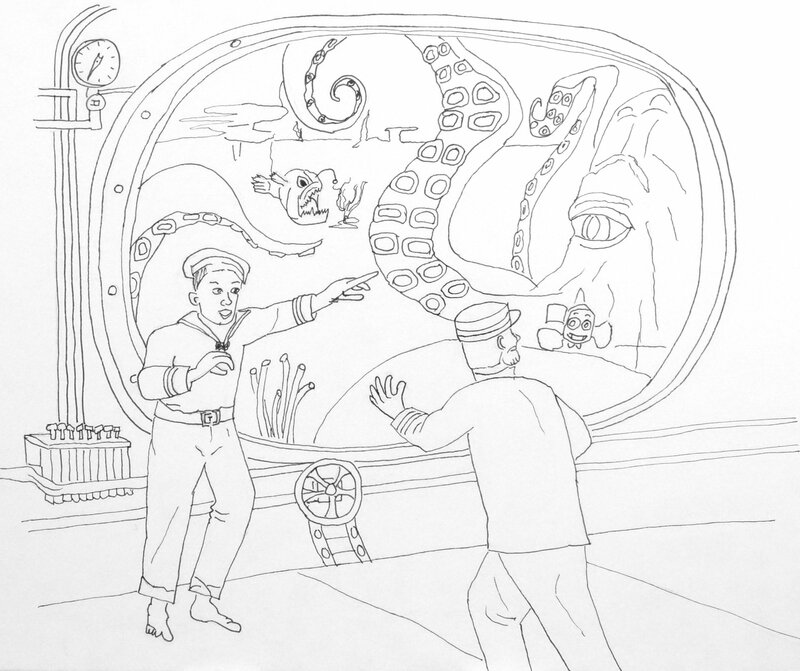 There are things in this drawing that I know no one else will notice like the gauge in the shadows in the upper left hand corner or the bit of yellow glow around the angler fish’s antenna or the blue reflection in the window sill or the blood shot eye of the octopus or the fact that his legs have two rows of suckers instead of one or that the first mate is barefoot. It’s all there because I thought about it and put it there. I now really appreciate the work that goes into a good illustration. 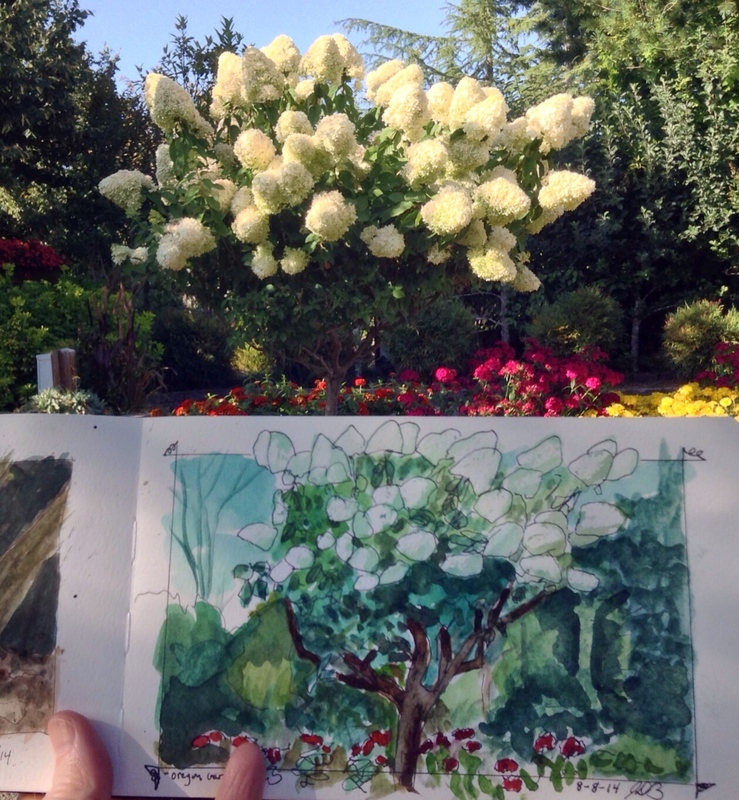 I went for a walk today in the Oregon Garden and tried out my new art bag and travel chair and my new lap board. Everything worked great. The first thing I did was walk around looking for an interesting subject where I could sit in the shade. I finally found a spot, deployed my new chair, sat down and looked around. I spotted two possible subjects – dark cattails in silhouette, and a large bush with spectacular white blossoms. I opened my bag and pulled out a small clipboard. I had clipped several sheets of typing paper to it before I left the house. I did two quick thumbnail sketches and a larger analytical sketch to warm up and learn a thing or two about my subject. 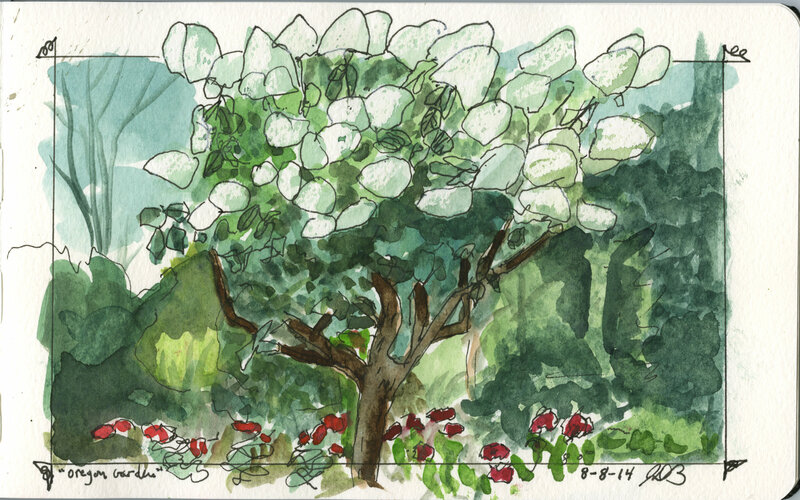 I then pull out my Moleskine watercolor notebook and drew the white bush using a Uni-Ball Vision black 0.7 pen which is waterproof. This is a new pen for me and this was the first time I had tried it on location. I really like it. It is very smooth and the ink drys immediately and does not bleed when you add watercolor. 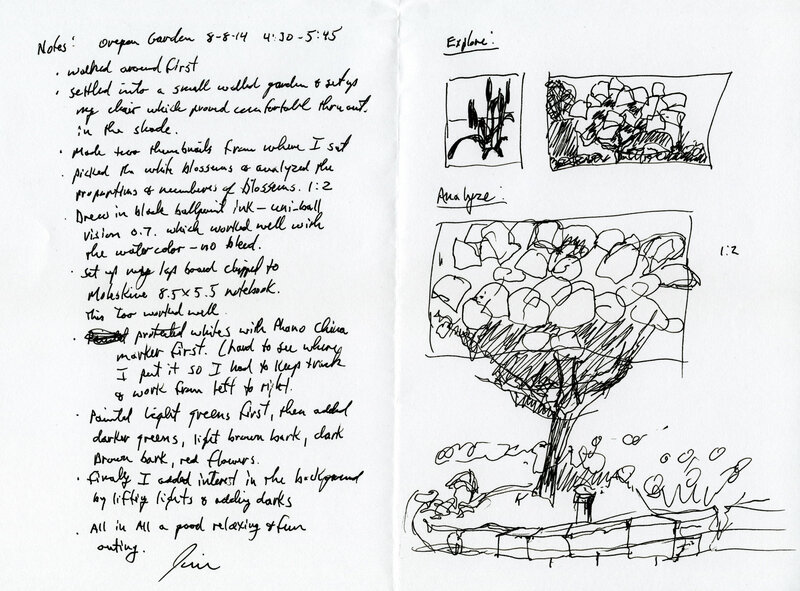 Here are my preliminary sketches and field notes which I wrote after completing the watercolor sketch. I protected the white highlights of the blossoms with a white Phano China Marker. It was hard to see where I put it (drawing white on white) so I kept track as best I could and worked across the page from left to right. I knew that the wax would leave a splotchy texture on this watercolor paper and give the impression of many small flowers within the large blossom heads. I worked from light to dark waiting for each layer to dry before applying the next. Finally I added interest in the background by lifting lights and adding darks. Here’s a photo reference I took after I was done. All in all a fun and productive outing. I’ve been interested in perception and observation for a long time. The first time I wrote about it was in 1974 when I was teaching several photography classes. My handout on composition included a section on “seeing” where I wrote: “Learn to observe and analyze. See with your mind as well as your eyes. Try to differentiate between “what’s there” and “what you see”. In a scene do you see a tree on a hill? Do you see the branches of the tree? Do you see the leaves or the sun reflecting through the leaves? Do you see the bird sitting in the tree? Do you see the shape the tree makes against the sky? Do you see the cool shade of the tree? Do you see the fruit of the tree? Do you see a place to sit in and relax or do you see a tall foreboding place to fall out of? Do you see summer? Do you see loneliness. Do you see life and oxygen? Wisdom? Old age? Photosynthesis? Roots? It’s all there, but what of whats there is important to you? The same subject will generate many different photographs depending on what the photographer sees”. Also, about two years ago I did a greenhouse sketch where I took my glasses off to see the major shapes, colors, and values. At the time I wrote: “We tend to believe that everyone sees the world as we do, but I’m beginning to realize that people’s perceptions are different. We have individual physical differences – things like pupilary distance, eyeball size and shape, lens flexbility, number of rods and cones in the retina, etc. – but we have also learned to notice different things. I use the central part of my vision. I look at individual objects and detail. It’s hard for me to take in a whole scene. Luckily I’m extremely nearsighted so when I take my glasses off, I can’t see objects or detail. It makes it easier for me to notice major shapes, values, and colors. Now I need to practice seeing those things with my glasses on. 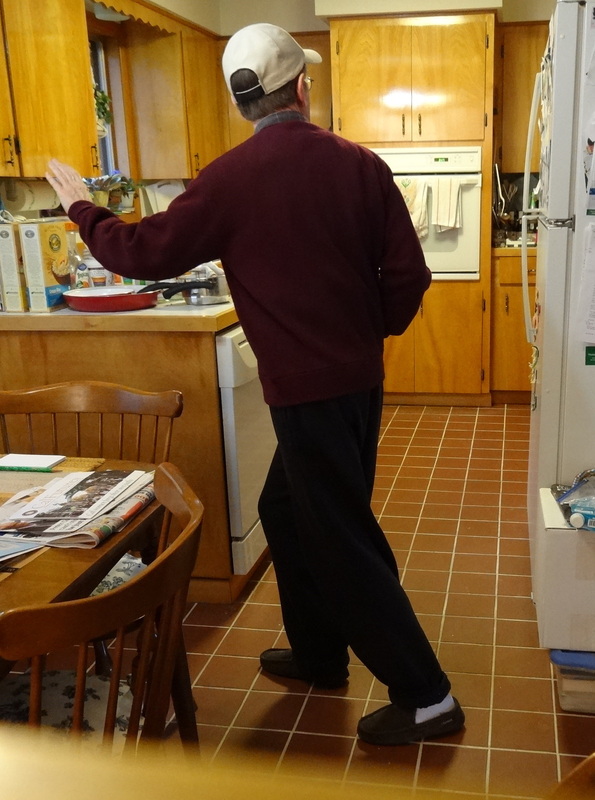 It helps to focus in mid air a foot or two in front of or behind an object. It’s hard (but not impossible) to break old habits of seeing”. This week I did the two activities and a project of my own. The first activity was to draw a piece of toast. This was a good first exercise. It reminded me to look closely and draw the detail as you see it, to take your time, and get in the zone. The next activity was called “Fast & Slow”. The directions were to first draw a one minute sketch with watercolor and a large brush and then (after it’s dried) to spend an hour drawing in ink on top of the watercolor sketch. I chose the vacuum cleaner because it was close at hand and had a fair amount of detailed complexity. I set a timer for one minute, took my glasses off and painted a very quick sketch with gray watercolor using a #10 round brush on a Bee heavyweight paper 8.5×5.5 spiral bound notebook. I put my glasses back on and spent the next hour drawing with a Platinum Carbon Desk pen and Platinum Carbon Black ink. I was surprised that my quick sketch was actually quite accurate proportionally. I pretty much followed the shapes I created with the watercolor as I drew with the pen. My project this week had to do with observation from a single location. I asked myself “What caught my eye”? 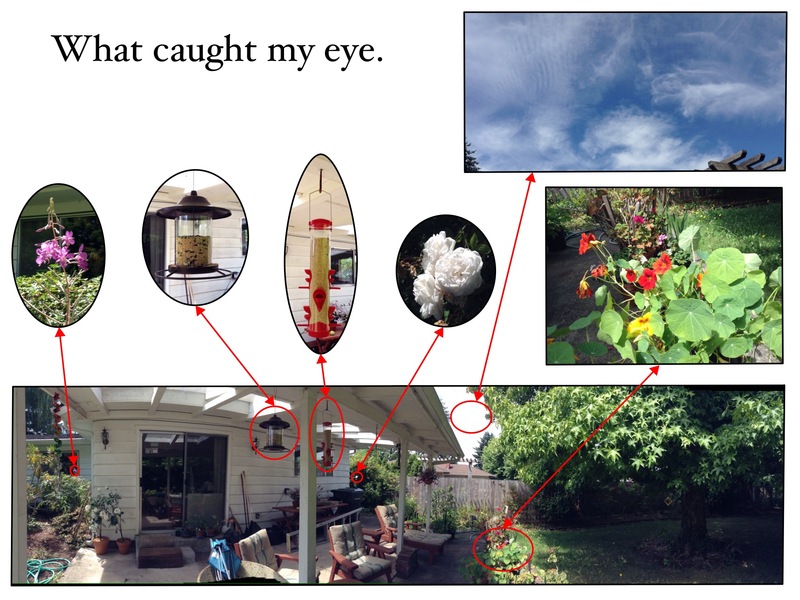 I was doing tai chi on the back porch taking everything in and my eye kept landing on several objects. Later I took a panorama with my iPod Touch and close-ups of each object. Why did I notice these things? My eye is drawn to contrast – the bright fireweed against the dark window and the white roses against the dark leaves. I look at highly saturated colors – the nasturtiums. I also look at objects which are novel. The two bird feeders are new and clouds are always new and interesting. I wonder what else draws my attention? Today I sketched the six subjects using a variety of media and techniques. I started with the fireweed. 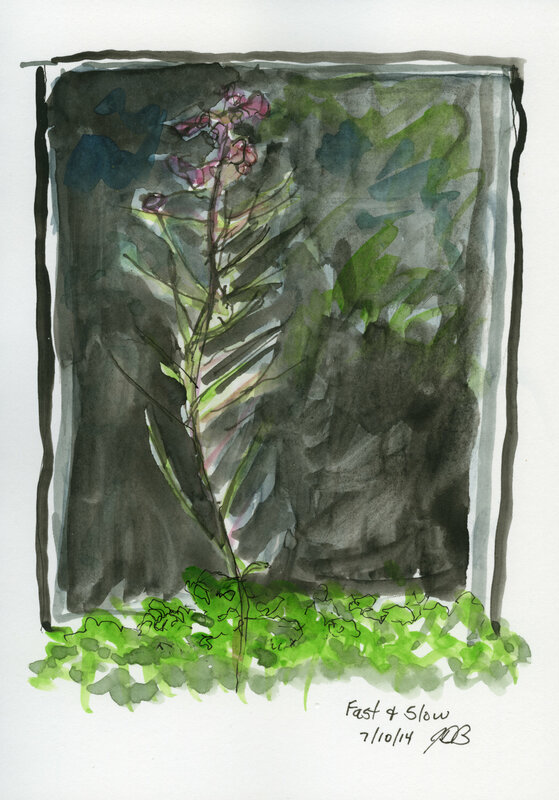 I did this fast and loose with pen and watercolor and made the mistake of trying to fill in the black window after I drew and painted the fireweed. 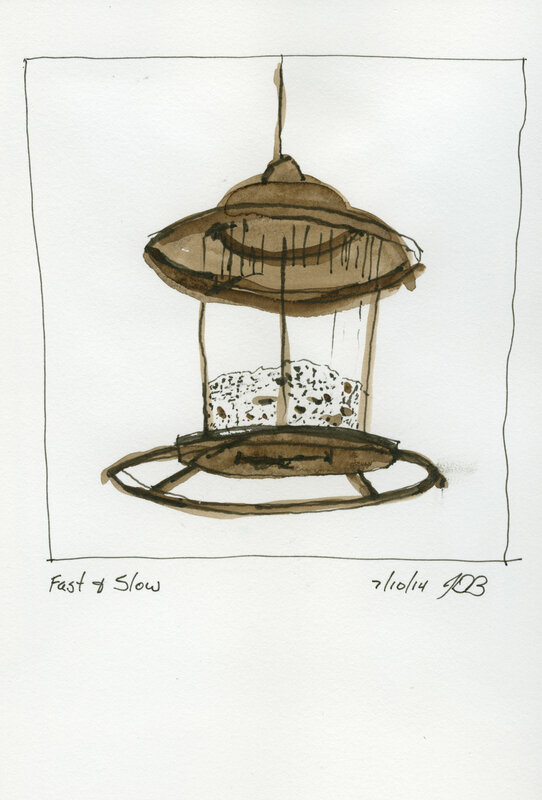 Next I drew one of the bird feeders. I painted with brown watercolor first and then added ink. This (though a simple drawing) was a little more successful. While it was still wet I turned my notebook over and painted the second bird feeder. Again watercolor first and then ink. I didn’t get the proportions right but I like the strong red shapes. I did these first three drawings standing. 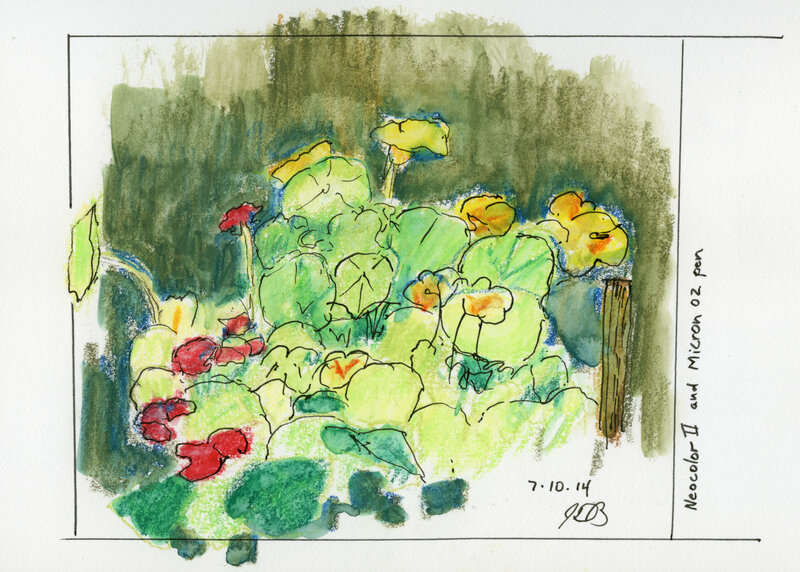 I sat down in the shade and sketched the nasturtiums with Neocolor II watersoluble crayons and a Micron 02 waterproof pen. The technique I used was to first draw with the Neocolor and then blend the color with water on a #6 round brush. After it dried I went back in and added line with the Micron 02 pen. At this point I took a lunch break. 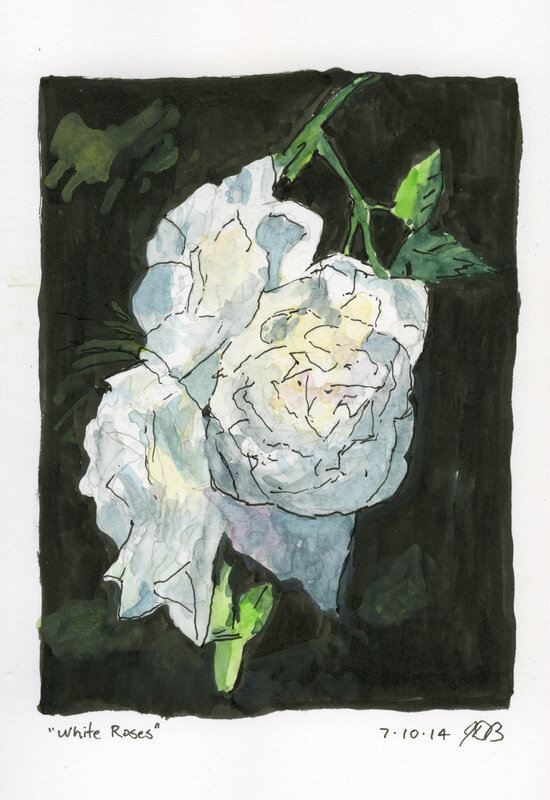 After lunch I drew the white roses. 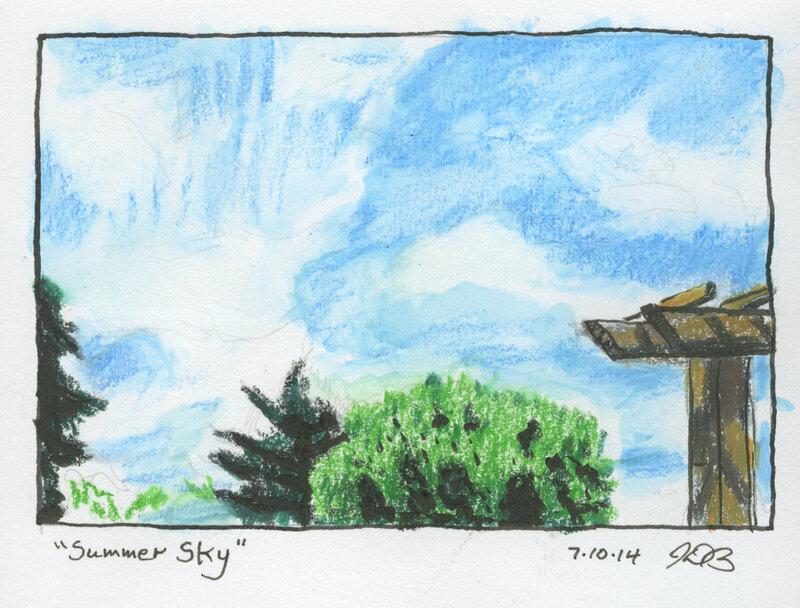 Finally, I drew a little sketch of the summer sky using Neocolor II, water on a #6 round brush, and a Pentel Brush pen. Again I drew at the kitchen table and used the photo I took as a reference on my iPad. 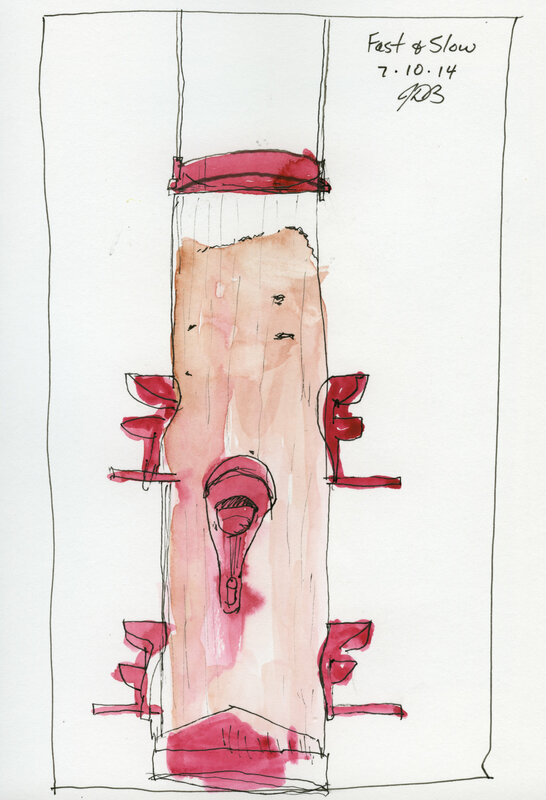 The more I sketched the more closely I observed and the better I got at representing what I saw. I made myself a new wallet. My old one wore out and I couldn’t find a new one that I liked. I wanted a bifold that was lightweight and stayed closed when I loaded it up with all my stuff. 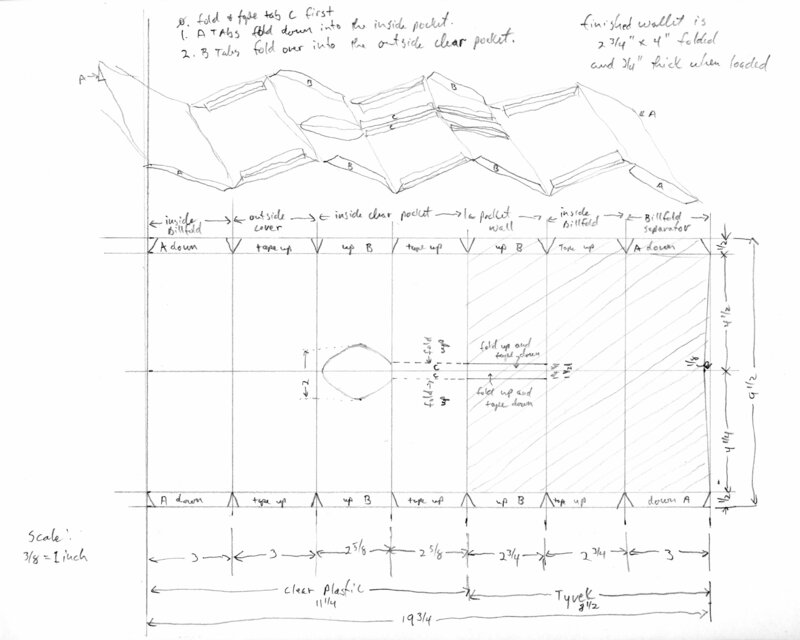 I discovered plans online for making your own wallet out of Tyvek (the woven plastic material that’s used to wrap buildings and to make protective clothing and shipping envelopes). First I made one using a large manilla envelope. This helped me figure out the folds. It’s a little tricky. I then made another out of the white plastic from the cover of a three ring binder and then I tried one using the clear plastic cover from a vue binder. I liked the clear plastic one. 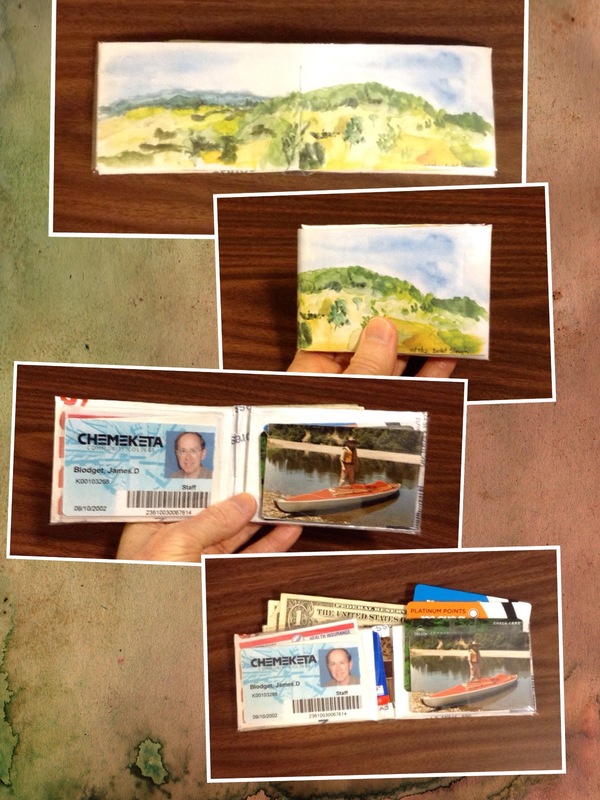 I found I could slip an inkjet copy of a watercolor in the pocket for the cover. This made a cool looking custom wallet. Everyone I showed it to loved it. The other advantage of using clear plastic is that the pocket that holds your driver’s license shows the entire card. After a week of use, I discovered that I needed more pockets for cards and a separator in the billfold area. I made another wallet with a clear plastic cover and license pocket. The rest of the wallet was made of paper. While I was testing this one, I ordered some free Tyvek shipping envelopes from the US Postal Service. Those arrived a week later and I made my current model which you see above. I used the clear plastic from a 12×12 inch memory scrapbook refill page I had on hand and the white Tyvek from a free envelope. Total cost almost nothing. Here is a plan with dimensions in inches. Notice the scale is 3/8 = 1 inch. I should also mention that I taped down all the tabs with clear shipping tape. I’ve been using this one now for a couple of weeks and it works and looks great. It has an outside pocket that runs the entire length of the wallet. It’s easy to slip in a 2 5/8 x 8 1/4 inch print to make a custom cover. I can also store some business cards in the same pocket behind the cover. Inside there are clear pockets on either side for identification cards or photos. These slip in from the center and each pocket has a curved opening to facilitate card removal. Behind each ID pocket there is a top loading pocket that can hold medical cards and credit cards. There are also two center loading pockets at the back. So, all told there are six pockets. The billfold is divided into two areas by a separator to keep your bills organized. I really like this design – both looks and practicality. The Tyvek is very light and strong. It is flexible and slightly slippery which makes it easy to remove cards and put them back in. Of course the clear plastic cover is completely waterproof and should hold up well with wear.